Business Advertising at Canadian Business Directory. 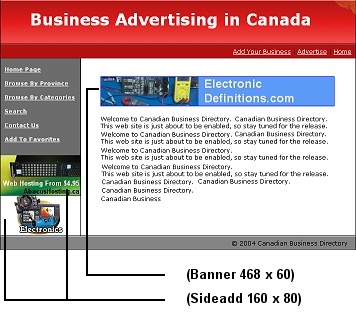 There are few different ways you can advertise at Canadian Business Directory. All types of Advetising on the internet at our web site are listed and explained below. When advertising at our web site you will gain access to full administration and statistics of your listings and add clicks. See our Canadian Advertising prices below. This is definitely most efficient type of advertising this give you a national exposure of your business to thousands and thousands of visitors every day. You can post your graphic or text banner, which will be displayed on top of the main area. A 160x80 pixels ad on the left side of the home page, just below the menu. This is also displayed to all users visiting the home page. This type is intended for businesses targeting whole Canada, excellent for Canadian National Advertising and business beginning to expend their products and services to whole Canada. Advertisements based on your keywords. Every day our visitors use Canadian Business Directory Search Engine to find the product or a service they need. Would you like to be on the top of the search results when search is performed for your product? This is another way to attract TARGETED visitors to your web site. Enter your keywords now and start receiving targeted visitors. Enter as many keywords or phrases up to 255 characters separated by comma. This is another effective type of advertising where you target specific customers that are interested in your type of business. Your banner would be listed on top of the category on all pages for that category. If you are looking for inexpensive advertising this is a perfect solution. Your add (sideadd) will be shown in selected category on the left side of the page, just below our links. The size of this sideadd is 160 by 80 pixels that could be in graphics or in text. Login or Register To Advertise - To be listed in multiple directories or other ad campaigns please login and setup your advertising campaign. Canadian Links - Need more exposure and need more incoming links for your website? You tried contacting webmasters and that did not go well. Get a solid link instantly from the home page at smart linking. Standard Free Listing - If you are not ready for paid advertising, we do offer free listing as well, simply register your organization online as standard listing is free for all businesses and organizations.